Chris Silverwood says he "absolutely" wants the Essex head coach job on a full-time basis. 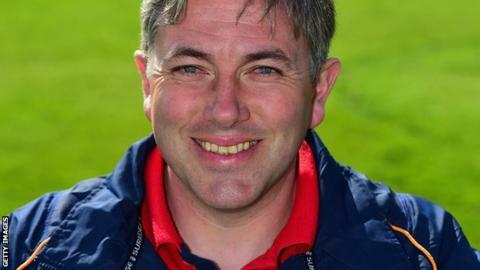 The 40-year-old is in temporary charge until the end of the season following Paul Grayson's departure from the Division Two side on 2 September. Former England Test bowler Silverwood had been assistant to Grayson since the start of the 2014 season. "Absolutely I want the job," Silverwood, who played for Yorkshire and Middlesex, told BBC Essex. Essex eased to an innings and 188-run victory over Derbyshire on Friday. "First we need to get through this game phase to the end of the season. I will throw my hat in the ring and we'll see where we go. "But, first and foremost, the important thing is to keep this momentum going and set the bar high for next year. "I'll look to galvanise the boys a bit. I look back at (the One-Day Cup quarter-final defeat against) Yorkshire and we had them. "We should've won that game and they're basically a Test side, so we just need to be a little bit more ruthless."